Parking is available on the street or in the Good Samaritan Hospital parking structure behind the Church on Marshall Street. A room is available adjoining the Narthex for parents with young children needing special attention during worship services. Visit us on YouTube and Facebook. Highlights are shown below. 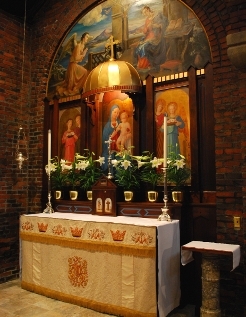 Mass is held daily, and the regular daily service schedule is shown on the left. A downloadable April calendar is available here, and a calendar for May is available here. Click here for a complete 2019 calendar. 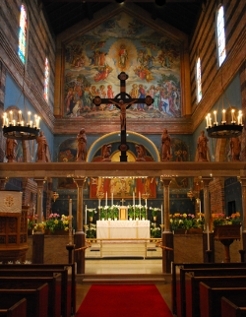 The Parish of Saint Mark is a member of the Western States Diocese of the Anglican Province of Christ the King, under Archbishop Frederick G. Morrison. The Parish of Saint Mark strives to teach and practice the "faith which was once delivered unto the saints", the original teachings of our Lord and Saviour Jesus Christ, with nothing added or removed. This is the faith of C. S. Lewis, T. S. Eliot and William Shakespeare. It is a Traditional Episcopal and Anglo-Catholic expression of the faith of the "One Holy, Catholic and Apostolic Church". More about our faith and beliefs may be found here.